Without a doubt, my favorite lipstick at this moment is L'Oreal Paris Rouge Caresse Mauve Cherie. I use it everyday like there is no tomorrow. I think I am finally getting comfortable with mauvish and purple color. Maybe, I am still not brave to wear Revlon Shameless in public and this is my current favorite. 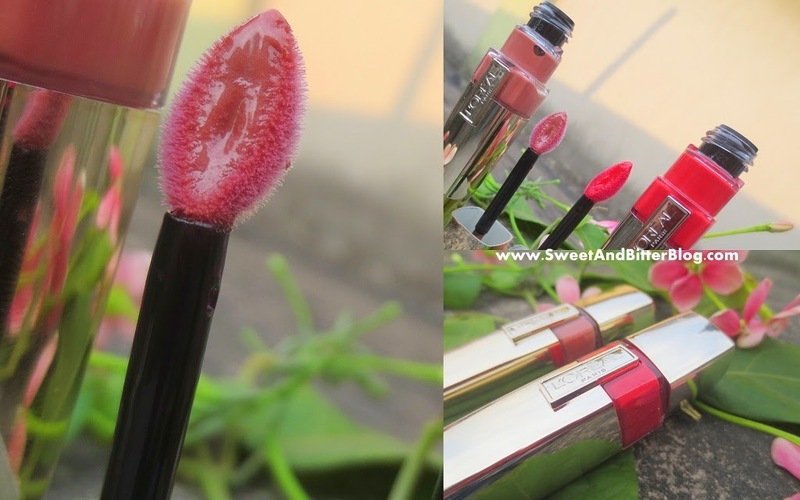 Formula - L'Oreal Paris Rouge Caresse Lipsticks have a very light texture and feel like nothing. Even a single swipe gives full color but it is better to wear another layer to hide pigmentation. Finish - The lipstick sets to full matte finish. I do wish it had more moisture but I never faced chapped lips because of them even when I wore them all the time in Gangtok where the air was quite dry and chilly. Stay - These stays with full intensity for around 3 hours. As they dry to a matte finish and are transfer resistant, these stay for long. In the first photo, I am wearing Mauve Cherie for more than 4 hours and had a meal of soupy noodles and hot momos in between. You can see some fading around inner side but otherwise, it looks good. Colors - There are 10 shades from the range. Most colors hover around pinks and mauves. 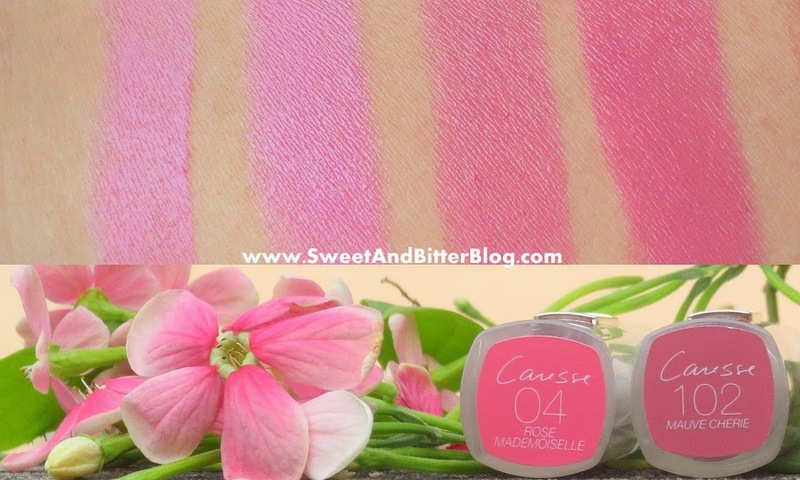 04 Rose Mademoiselle and 102 Mauve Cherie does not have any shimmer. 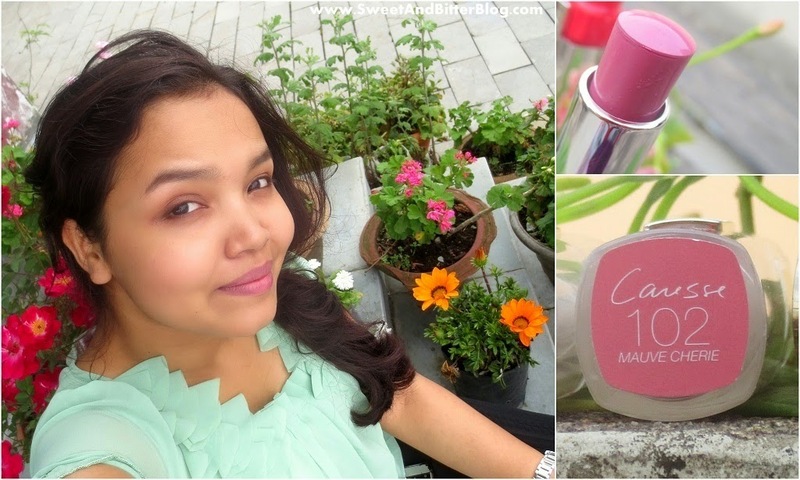 While Mauve Cherie suits my skin perfectly, Rose Mademoiselle washes me out. 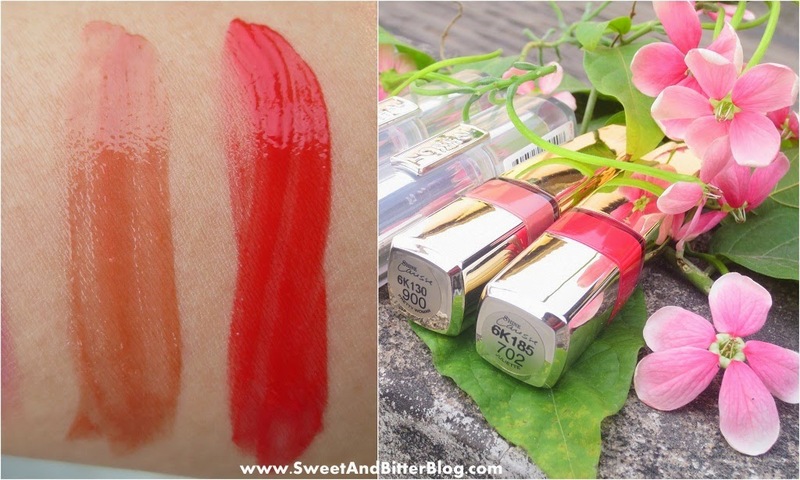 Though both look almost the same on my lips but Rose Mademoise is cooler. Do remember that the colors are not 100% true to the lipstick bullet so, please wear them on lips before you purchase to check how it goes with your skin color and tone. 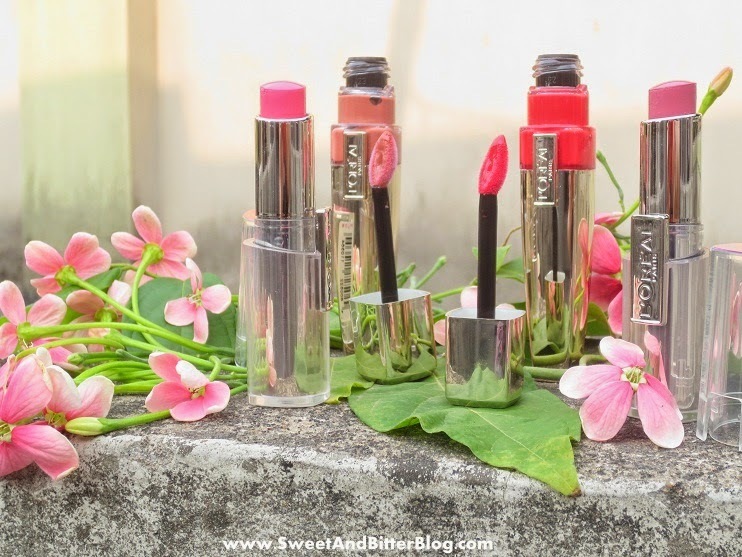 Formula - L'Oreal Paris Shine Caresse Lip Color are truly the new generation of lip gloss. I do not like lip gloss and always keep safe distance from them but 'Pretty Women' got me hooked. The formula feels watery but then sets to a silicony light texture. Brush - The brush is unique for a drugstore brand. There is a hole in between which transfer the excess color to the other side as you swipe it on your lips. This prevents anyone from wearing too much gloss (is there something called too much gloss?) and keeps you feeling light all the way. Finish - The finish is light but I felt a little uncomfortable with the silicony feel on lips. I prefer wearing them over lipsticks to avoid the feeling. Stay - These stays with full intensity for around one hour tops. Along with a lipstick, the stay improves a bit. Juliette stays longer than Pretty Women maybe it is being darker and more pigmented. Colors - There are 14 shades from the range. 900 Pretty Woman and 702 Juliette do not have any shimmer. Here, I am wearing it at Tashi View Point in Gantok. My idea was to show you Kanchenjunga in the background but it was foggy when we went there so, enjoy the flowers from Gantok. 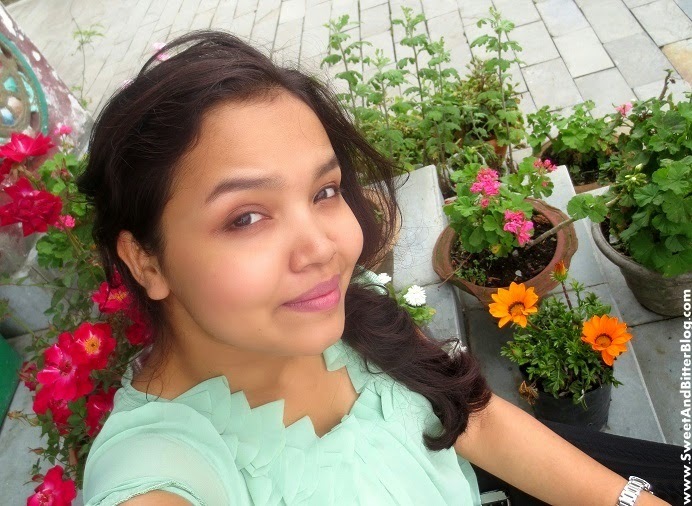 BTW, the pink flowers along with the lipsticks are from Kolkata.